oparallel is a post-estimation command testing the parallel regression assumption in a ordered logit model. By default it performs five tests: a likelihood ratio test, a score test, a Wald test, a Wolfe-Gould test, and a Brant test. These tests compare a ordered logit model with the fully generalized ordered logit model, which relaxes the parallel regression assumption on all explanatory variables. Optionally, oparallel can use the bootstrap to compute the p-values for these tests. A discussion of these tests was given in a presentation at the 13th German Stata Users' group meeting. The slides of that talk can be downloaded here. Computing bootstrap p-values for the Brant test. 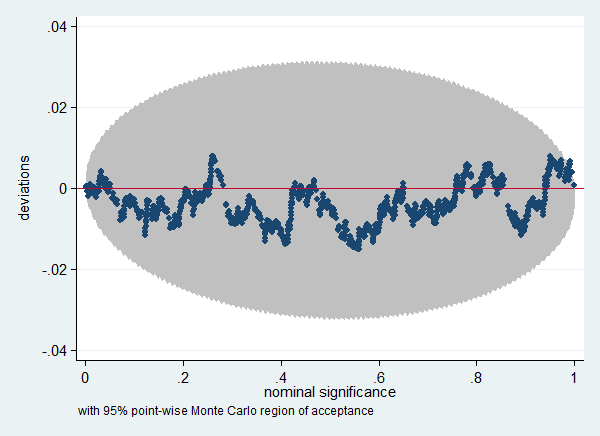 The bootstrap p-values (ASL) is close to the asymptotic one (P>Chi2), but the uncertainty due to the randomness in the bootstrap procedure is large enough that the Monte Carlo confidence interval (95% MC CI) does still include 5%. 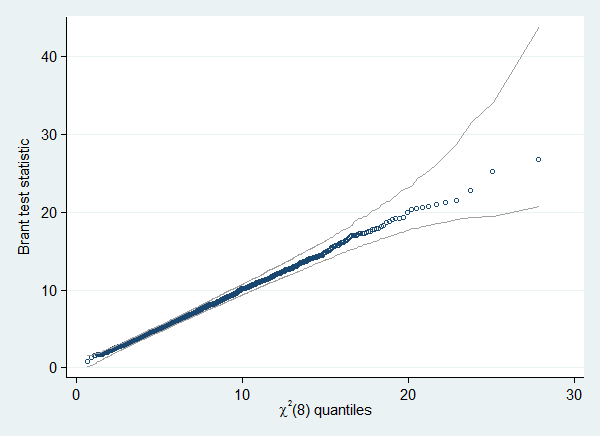 The distribution of the test statistics from the different bootstrap replications is an estimate of the sampling distribution of that statistic if the null hypothesis is true. You can save the test statistics using the saving() option, and check if that distribution corresponds with the theoretical distribution; a Chi-square distribution for the test statistic and a standard uniform distribution for the p-values. In this case the Brant test seems to perform well. Situations where these tests are likely to fail are discussed here. This example requires the qenv, qplot, and simpplot packages.